Without shared vision we don’t know what to create, only what to tear down. One of my very first classes in my doctoral program was called “Inquiry and Measurement in Education”. While ostensibly the course was about learning to craft respectable research studies, what we really focused on was the fine academic art of how to critique and pick apart other researchers’ studies. We were trained to look at methodology with fine-tooth comb. Was it internally and externally valid? Was the n too small? Did it properly define all constructs? Was it missing a key perspective? Okay, was it missing any perspective? Does it cite everyone important…how about everyone in the room? If the answer was “no” on any count — Invalid! As a new researcher, it felt like I was honing valuable skills — it was mind blowing all the ways studies could go wrong! And, frankly, it was incredibly satisfying when I was able to find the flaws in more advanced researchers’ studies (the academic nerd equivalent of “movie stars are just like us — they grocery shop/don’t shower/have cellulite too!”). Until it came time to do my own research. At which point, the extensive flaw-finding skills I had developed proved paralyzing when trying to design a study of my own. I could only see the negative in any choice I made. It turns out it’s much easier to find flaws than to build something solid. There are always flaws. The design of a study, like the design of a school, is a series of choices and nearly every choice has a tradeoff. The goal, it turns out, is not to design the perfect study — this is impossible — but rather to be able to design a workable study that gives credible insight into a problem or question you care about. But what do we care about? We spent so much time training as researchers who could ensure methodological rigor and thus justify we had found something “true” that we spent too little time for developing as scholars who could engage in debates about what was “right”, good, just, fair, or desired. Broadly, in education research (and practice!) we are far too focused on how to figure out what is “true” (in the limited sense of what we can prove through measurement) and are not nearly concerned enough with what is “good” or what we’re trying to achieve. “True” from a researcher’s perspective means it can be empirically proven, which in practical terms means spending time finding increasingly good ways to measure phenomena. But ‘true’ in this sense doesn’t tell us what is good or right. It can be true, for instance, that rote memorization of facts improves math performance on standardized exams. That fact doesn’t give us insight into whether we care about what those tests measure. Our obsession in research with what is “true” has led us to promote methodological rigor as a “gold standard” — when it’s actually only a tool in a larger toolbox for moving toward our vision. Without the vision it’s impossible to see whether what is “true” is helpful in achieving our larger goals. To be clear, I am not arguing methodology is unimportant. Methodology is important. But figuring out what is “right” or “good” requires far more than excellent methodology. It requires we have moral and ethical discussions about what we want for our lives, for our schools, and for our society. It also requires we move beyond critique and toward building shared visions. Critique is valuable when used to guide future action toward some kind of ideal. But without a shared ideal critique alone becomes paralyzing and demotivating — and this holds true in research, practice, and policy. Check out Tye Ripma’s blog piece this month on how this dynamic plays out in schools. For critique to be productive, it needs to be developed from a positive clear vision of what is good. In school reform, policy, and practice today we are overrun with critique and lacking positive shared vision. There is considerable concern and disagreement about how schools should be run, who should manage them, which curriculum to use, or how to best organize the bell schedule — yet there is little discussion about the kind of society or individuals we hope to foster through schooling — a.k.a. the vision toward which schooling should be organized[i]. You can’t “continuously improve” unless you know what you’re building toward. We need a new, positive vision. In a democracy, creating a shared vision means finding commonalities across differences and considering practical and political interests. It requires asking beautiful questions and inviting people from different walks of life to participate in a reflective process. In other words, it takes engaging directly in the practice of deliberative democracy. It requires a process, not a one-and-done solution or program. 1) What is a “good life,” now and in the future, for children you care about? 2) What is your ideal role of schooling in creating those good lives? 3) Will school do this for the children you care about? For all children? 4) If not, why not? How would we change schools so they do? You need the whole theory of change to understand people’s thinking — not just questions three and four. So, what are we finding? We are early in the process, but so far we’re finding considerably more agreement than disagreement. health (physical, mental, and spiritual). Broadly, people’s answers are not only similar to one another, they also fit with the Aristotelian ideas of flourishing or, eudaimonia. Aristotle asserts that a good life is the equivalent of being happy, but this is not the feeling of “happiness” in the sense that it is often used today[ii]. Rather, a eudaimonic life is one in which an individual is able to take deliberative action, aligned with their values, about the things that are important to them (and also does not suffer deprivation in terms of external security (financial, physical, etc.)). When questions about schooling are asked within the context of creating these kinds of lives, school’s role in a broader set of outcomes than just “learning” is clear. Students, parents, and educators all see school playing a range of roles within achieving these good lives they want — everything from the content learning (that is most frequently discussed in current debates), to the character building, identity development, socialization and preparation for adulthood[iii]. To summarize: what is coming out clearly thus far is that people want kids they care about to live well, do well, and be well — now and in the future — and they hope schools will play a part in nearly all aspects of that. We want kids we care about to be prepared with the capacities, character, and beliefs, to make informed decisions about their lives, according to their values, and to be able to work with others to make their world better. This is a vision for how schools might serve individuals, and it’s broader than just learning. For the collective social possibility purpose of schooling, we can again draw on Aristotle for inspiration. To be able to flourish as an individual we need to live in a society in which our core needs are met, and in which we have the freedom to make choices about our lives. A thriving democracy would achieve these ideals. [iv] While there was broad consensus about what it meant to live a good life and the role of school in creating it, there was a clear divide between school contexts about opinions of whether the school would do this. In poorer, less resourced schools, parents and educators were less certain their schools were playing the role they hoped. I’ll come back to this in future pieces on equity. 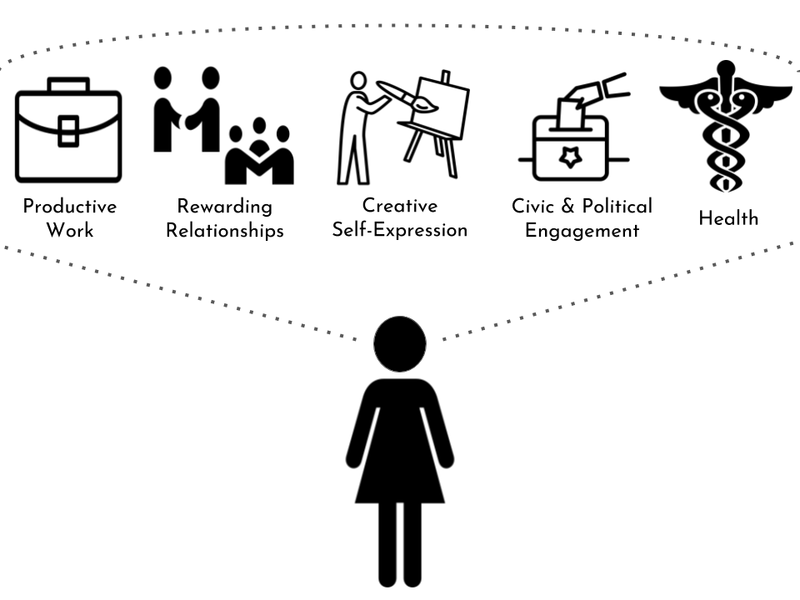 Ideas about how to design schooling for human flourishing and thriving democracy.